If you passed the time indoors this winter by researching gorgeous flowers and plants online that would look great in your garden, you’re probably itching to get outside and start growing. However, before you begin, you might want to read up on a few more tips – in particular, those involving perennials. Purdue University’s Department of Horticulture hails perennials as one of the most crucial components to any flower garden. Varying in size, shape, color and texture, these plants add interest and beauty to your garden for years, meaning you won’t have to worry about frequent replanting. They’re the kind of spring flowers that just keep coming back. 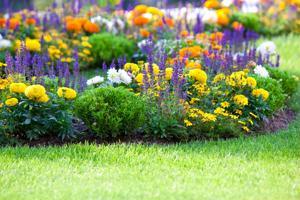 Gardeners.com reports that many perennial gardens use the flowers in borders or island beds. Borders are typically rectangular flower beds that run along a backdrop like a wall, shrubs or a row of trees. An island bed sits by itself in the middle of the lawn. Oftentimes, adding annuals, trees, ornamental grasses and shrubs into your garden is a good way to fill in the gaps and ensure that your yard has dependable beauty each blooming season. If you’re unsure which types of perennials would suit your garden, it’s relatively easy to find out. Just research online to find out which species thrive in your particular area. Better Homes and Gardens Magazine also suggests using tried-and-true favorites like phlox, asters, peonies, daffodils and black-eyed Susans, which are all easy to grow – even for beginners. According to Better Homes and Gardens, container-grown perennials are easy to plant. All you have to do is dig a hole that’s a bit wider than the pot it came in, then loosen up the roots and spread them out into the hole. Firm the soil up around the roots, then give the plant plenty of water to get started with. Add 2 to 3 inches of mulch on top of the soil around your plants, which will hold in moisture and keep out weeds. To keep your perennials looking gorgeous, the news source suggests regularly cutting back dead flowers and dividing the root systems. If you don’t divide your perennials every few years, they’ll start to crowd themselves and potentially suffer. Early spring and fall should be when you separate the plants. During the winter, most hardy perennials don’t need much care, but you might want to insulate the roots from damage with plenty of mulch.